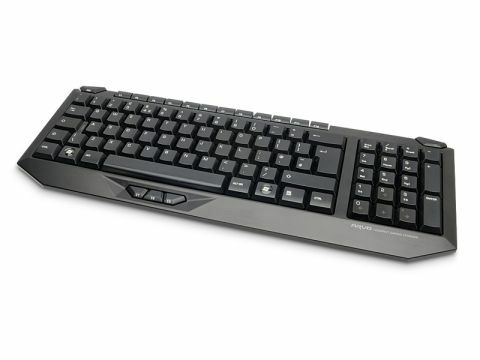 Can this compact gaming keyboard redeem Roccat's previous efforts? As a regular reader you might well have noticed German peripheral manufacturer Roccat hasn't got off to the greatest of starts in these hallowed pages. The Valo keyboard was overpriced and refused to work pre-OS and the Kone mouse stuck its head in the sand and refused to acknowledge the existence of Windows 7 despite its claims to the contrary. So, third time lucky with the Arvo? Thankfully it's a resounding yes. The Arvo is a compact keyboard designed to take up the minimum space on your desktop without sacrificing any functionality. We're not talking notebook keyboard design here; the Arvo comes with a fully functional num-pad, but with a touch of a switch you can access the alternate navigation keys (home, cursor keys, page up/down, etc.). The function keys are recessed into the top of the board too, reducing their footprint while still making them accessible. This is still a gaming keyboard though and as such has three programmable buttons beneath the space bar. They require a definite press though, so mis-strikes are kept to a minimum. The keys are perfectly positioned for your thumb when your left hand's resting in the traditional gamer's WSAD claw. The build quality is one thing we never had a problem with despite our other issues with Roccat kit, and that's carried over to the Arvo. It's solid with a reassuringly tactile action to the keys and no bend in the board. It's fairly aesthetically pleasing too if you're into your rather angular, stealth fighter look. The recessed F keys might take a little getting used to, but for those of us with cramped desktops (i.e. we're that damned messy) or if you travel to LAN parties a lot it's a definite winner. So well done, Roccat, you've finally hit the right note. On the third try.